Back in 1992, Mexican writer/director Robert Rodriguez captured the attention of Hollywood with a tiny little $7,000 film known as El Mariachi. From there, he went on in 1995 to create the sequel, Desperado, which starred Antonio Banderas and managed to gross a respectable $25.6 million at the box office against a budget of only $7 million. Seven years later, with movies like From Dusk Till Dawn, The Faculty, and the hugely successful Spy Kids under his belt, Rodriguez will complete the El Mariachi trilogy with Once Upon a Time in Mexico, which features an all-star cast and a $30 million budget. 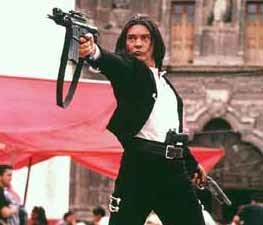 Rodriguez describes this final installment as “The Good, the Bad, and The Ugly of the Mariachi series.” The primary character in the film is again El Mariachi (Banderas), who carries a guitar case full of weapons and kills lots of bad guys. In Once Upon a Time in Mexico, our hero makes his way across the rugged Mexican desert landscape in search of Barillo (Willem Dafoe), a cartel leader who may intend to assassinate the President of Mexico. A corrupt CIA agent (Johnny Depp) will also attempt to push El Mariachi’s buttons, culminating in what is sure to be a story with themes of revolution, greed, revenge and violence. In addition to Banderas, Dafoe and Depp, the cast will also include other bigger names such as Salma Hayek (who was also in Desperado), Rubén Blades, Mickey Rourke, Cheech Marin, and even pop singer Enrique Iglesias. The movie’s title is an homage to the movies Once Upon a Time in China and Once Upon a Time in America.